Enhance the look and increase the comforting feel of your home by installing a roof lantern. They are ideal for any type of home, increasing the amount of natural light and helping to reduce your energy bills. Our stunning range of roof lanterns available is guaranteed to be a creative, beautiful addition to your home. Why Invest in Our Roof Lanterns? Roof lanterns are ideal for any type of home that is craving extra light. Its ability to utilise the natural light from the sun to ensure it brightens and naturally heats up a room makes it a valuable addition to any home. The double-glazing provided with every roof lantern as standard offers enhanced views of the outside, and easy maintenance. The slim sightlines and wider glass panels ensure you are able to enjoy your home, letting you relax. Based in Fleet, Our extensive range of high-quality roof lanterns offer a plethora of benefits that will enhance your property. Provided by Hart Windows, each one is guaranteed to be highly effective in reducing your energy bills, by helping to keep heat inside your home. Each roof lantern is made from the highest standard of material that ensures you are provided with slim sightlines and maximum window space. This means your home benefits from ample amounts of natural sunlight, making it look bright and more spacious, reducing your need for artificial lighting. Privacy is an important aspect for every homeowner, which is why our range of roof lanterns are available in a range of different glass options and finishes. Its position on the roof ensures it keeps the prying eyes of unwanted attention away. Don’t compromise on the privacy of your home. How Will Our Roof Lanterns Benefit Your Home? Keeping harsh weather conditions outside of your home is easy with an installation of our roof lantern. The intelligently designed frame is manufactured to provide airtight seals around all window panes to ensure water and other harsh weather conditions are kept outside. We understand that not all houses are the same size, which is why we tailor make each roof lantern to ensure it fits perfectly in the space provided. Each one is manufactured to guarantee it eliminates the risk of cold draughts entering your home. Roof lanterns are renowned for enhancing the aesthetic of any type of home, making it look like a newly renovated building inside and out. As they are made from the highest quality material, each one is designed to be low maintenance, so all it needs is a quick wipe to stay looking brand new. We pride ourselves on offering variety to our customers, which is why we have chosen to work with Atlas, providing you with high-quality products at an affordable cost. All their products are quality tested to ensure they provide you with all the benefits you would expect. Available in a range of different colours and finishes, our roof lanterns are guaranteed to match the interior and exterior of your home. Our aluminium roof lanterns designed by Atlas will allow an influx of light into your home. They can also be installed with self-cleaning glass to ensure that the hard to reach areas are always maintained. 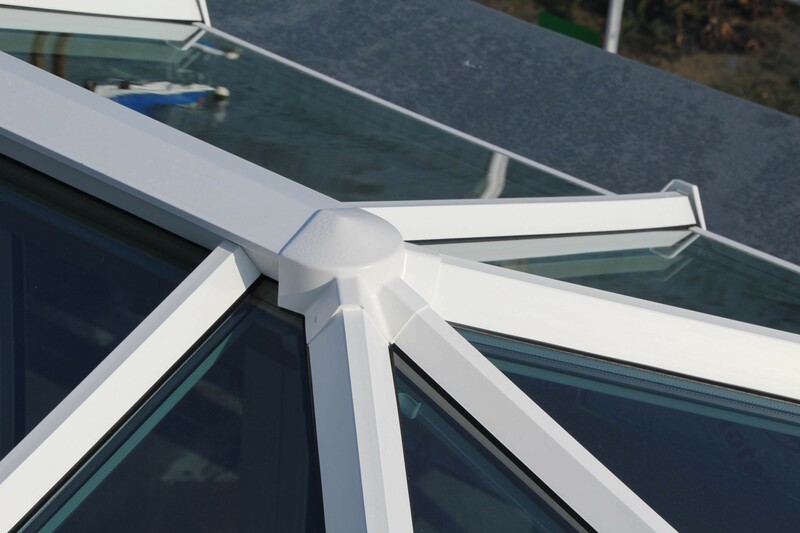 To ensure we are offering a variety of products, we also work with Eurocell to provide the best roof lanterns on the market. The customisation options available on their products ensure you are getting the most out of the service. You can choose from either two bar or three bar options to amplify the amount of light entering your home and clear glass space. The uPVC roof lanterns and skypods that we offer will enhance your home. Not only will they add value to your property, they will also create a stylish living space for you, your family, and guests to enjoy year after year. Installing a roof lantern into your home could save you money on your energy bills. It’s a well-known fact that heat rises, so our roof lanterns offer the best protection against heat escaping. The double-glazing used in the window panels ensure heat stays inside, gradually warming your home. If you are looking for the privacy frosted glass window with the benefit of increased natural light, the roof lantern is perfect for you. This combination ensures prying eyes won’t be able to look inside your home. The tough glass also keeps unwanted intruders out – it’s ideal for any home. With our range of colour options and finishes, you can ensure your roof lantern looks exactly like the rest of your home. Our team of experts are on hand to talk you through all the design options you can choose from, making sure you get the product you’ve dreamed of. With their beautiful shape, increased light potential and enhanced views, roof lanterns are an affordable, worthwhile investment into any type of home. It has the ability to transform homes from looking dull and dark to bright and modern. Our team of highly-skilled experts are on hand to offer their experience and knowledge in the industry. They are available to answer any questions you may have, ensuring you are well informed and guided through the process. To find out more about the large range of roof lanterns we have available for you, contact us today. A member of our experienced staff will be on hand to go through all the options with you, giving you a quote in minutes. Alternatively, you can use the online quote generator to find a bespoke price.